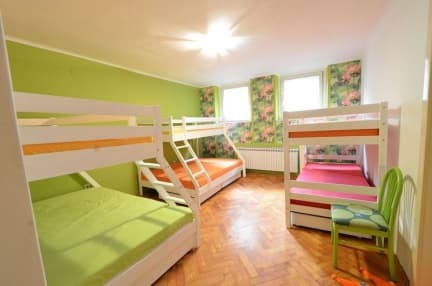 Hostel BALKAN HAN is situated in the heart of the city, less than 200 meters from city promenade (pedestrian Ferhadija street) and all the attractions city has to offer, where travelers will meet multicultural BALKANS in new-age edition, feel the great Bosnian hospitality, enjoy our green garden, colorful rooms, party in our stylish bar, experiencing the word 'HAN' (dating from the Ottoman era) meaning 'lodging for travelers and their caravans'. - beautiful wide green garden that we are specially proud of; in the natural shade of trees, arranged with chairs, hammocks and benches, it's a perfect place for relaxing, having coffee, tea or even a BBQ, with possibility of Open Air Cinema! Very nice, every thing was the best for me! Thanks a lot! Had an amazing experience staying at the Balkan Han. The staff is so friendly! The owner and the manager are always around to make sure everyone is ok and they give you the best tips about restaurants, what to do and bars in Sarajevo. The mattresses are way better the every other hostel and the atmosphere is really good. Stayed two days more in Sarajevo and this is mostly because of what these guys did. This is a great little hostel, with friendly approachable staff, unassuming but in a great location. Beds were comfortable and there is a cozy bar, terrace and kitchen. I stayed with a female colleague and both of us felt safe and secure the whole time. Amazing place to stay in Sarajevo. Very good location just couple of minutes to walk everywhere. Place is very clean and nicely decorated. Highly recommended !!! Really enjoyed my stay here! 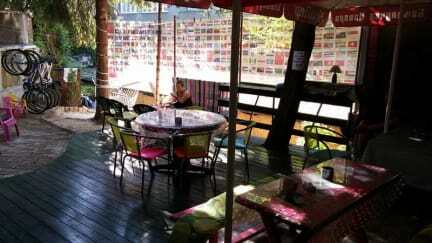 Owner and staff are very cool and friendly and manage a really nice hostel in the heart of Sarajevo. It's down the street from Blind Tiger and old town and entertainment galore! A great clean inexpensive place to stay during your discovery of wonderful Sarajevo! My fave city in the Balkans! Thanks hostel Balkan han! Balkan Han was awesome! I really liked their customer service! The hostel is relatively convenient to the old bazaar (15 mins walk) and also other amenities like grocery shops etc. The place was really clean and I even cooked for some of the guests and volunteers! I had a really great stay with Balkan Han. However, for those who needs lots of space in the bathroom, do note that the bathroom is quite small. Also, they don't allow outside alcohol. Overall I would stay here again!